Do you really give a free, no-obligation inspection? Absolutely. We appreciate every opportunity we have to assist with your roofing needs; therefore we treat each call with the same level of importance. After you schedule your free inspection, we will come to inspect your property and assess all potential problems we observe. Our inspection is always based on an honest and professional evaluation. A local company with history of doing business under the same name for long time, with a good reputation and clean, active license should be sufficient. How do I know if I need a new roof or just a repair? If you currently have any issues with leaks and you debate to repair or replace with a new roof, first you have to find out in what condition is your roof. Call Vel-U Roofing to schedule your free, no obligation inspection today; this way you will save a lots of money for small repairs first and a new roof eventually. Can you just over – lay a new roof over the existing roof instead of a tear off? Providing that there is no more than 1 layer of existing roof, and building structure must be able to handle the additional roof load. The Uniform Building Code states that only 2 layers of roofing material will be allowed on any residence. This may vary by city and county Codes. Ideally it is better if the roof is removed. There is always the possibility when installing a new roof over the existing one, that the old roof may carry an uneven look into the new roof. The new roof must be attached to the roof deck to meet wind loads (it is not generally acceptable to adhere the new roof to the old layer of roof). This question will always depend on a few factors (roof type, pitch/slope of the roof, proper ventilation, installation, maintenance, and weather). this is a good rule of thumb to go by: basic three tab fiberglass shingle: 15 to 20 years. Flat roof: 5 to 10 years. When is the best time of the year to put a new roof? Some of the materials used in the roofing business might require installation above freezing point. Often time roofing material manufacturers do not recommend installing of their products when temperatures fall below certain ambient temperatures. What type of roofing material is the right for my roof? There are hundreds of different roofing materials to choose from, each of them meant to fulfill a specific need. In helping you decide which roofing material will best serve your needs the important factors to remember when choosing a products are durability, appearance, warranty and product life-span. Call Vel-U Roofing today and one of our professionals will assist you in making the right choice. Yes, because this is the only right thing to do; it does not make any sense to install a new roof over somewhat damaged structure. Replacing a roof on a building is a labor-intensive project and, depending on the type and size of your roof, could take anywhere from a day to few days. 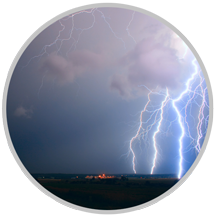 The time involved is substantially affected by the weather, as well. Wind, snow, rain can slow the process considerably. What is an ice dam and how to prevent it? Ice dams occur when snow melts near the ridge-lines of warm roofs (roofs without adequate ventilation). As the water runs down the roof to the overhang, it cools and freezes. If the snow continues this melt and freeze process, an ice dam can form that can seep under the shingles, through the decking and into the house. This, of course, can cause serious roof leaks–even in freezing temperatures. The best prevention to ice dams is a well-ventilated (cool) roof. Additional protection for your roof can be applied with a rainproof ice and water membrane. My gutters are old and rusted. Can I repair them or should they be replaced? It depends on the amount of rust and corrosion in the gutters. Once metal starts rusting, it does not stop. Some gutters can be repaired, but eventually the rust and damage will cause leaks. 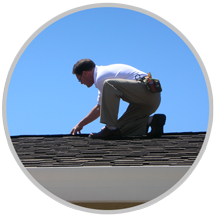 We can consult with you on the portions of your gutters that require replacement. As a preventative measure, homeowners should keep the gutters clean and free of debris and other obstructions. We recommend gutters to be cleaned twice a year. Maintaining your gutters clean can assure proper water drainage, and prevent possible damage to the edge of your roof and your gutters. We offer: * Annual or Semi-Annual Inspections and Maintenance contracts.